"Nature for us is more depth than surface." 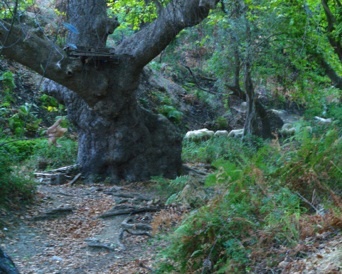 The small area of land that is now Skopelos has a dramatic geological history. Arising from the bed of the ancient Tethys Ocean, it has at times been on a deep continental shelf, an ocean reef and a tidal lagoon. In all these places rocks which form the island were created. For millions of years it was part of a large continent where wide valleys were formed and erosion and weathering created deep rich red soils. 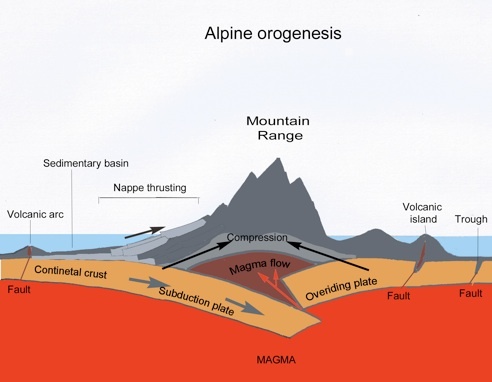 Collision of continents and resulting tectonic forces created volcanoes and forced up mountains from the Alps to the Himalayas. 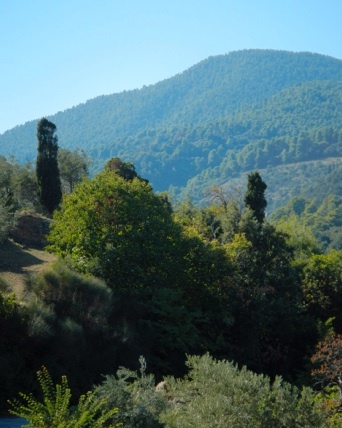 Skopelos was once part of the Pelagonian Mountain Chain. Upthrust and cross folding constructed the Mount Delphi, the Glossa peninsular was formed by overthrust of rocks from a neighbouring zone and overthrust and folding created the Palouki Massive. 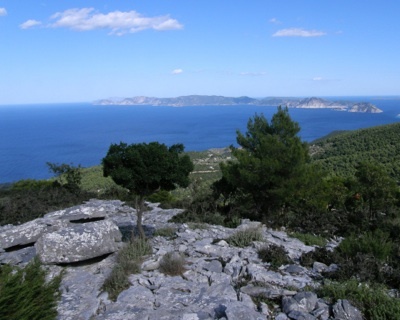 Subsequent changes in the levels of the Mediterranean sea, evaporation of sea water and fresh water basins have added to complexity of the geological structure of Skopelos and a large variety of rock and soils have been described. The movement of continental plates and resulting seismic activity continues. 250 million years ago the earth was very different from today. 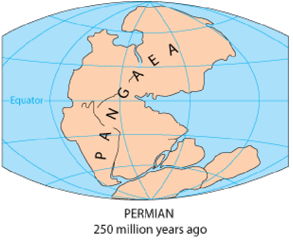 One large continent, Pangea, was surrounded by a single ocean, Panthalassa, but changes began then which eventually led to the present configuration of the continents and oceans. 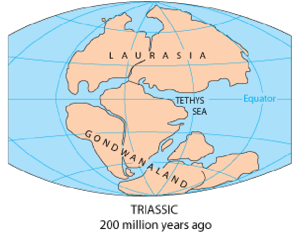 In the Triassic period, about 200 million years ago, Pangea began to break into two large continents, Laurasia in the North and Gondwana to the south with the Tethys Ocean developing between them. A sea that would later be destroyed. As the continents drifted apart and the Atlantic Ocean developed, the Tethys ocean was created and later subsumed by tectonic activity. Subsequent dramatic changes occurred in this area as a result of the tectonic collision of the African plate and the Eurasian plate. 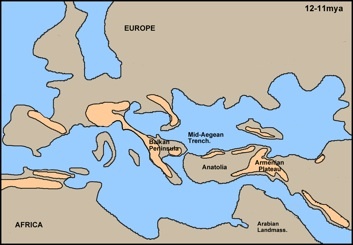 It was during this phase that the Alps, the Dolomites and the mountains of Greece originated. 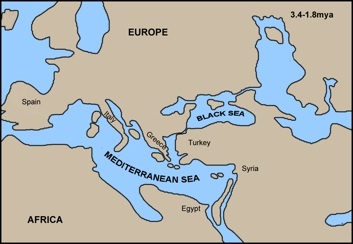 In the Messinian Age, (5.96 to 5.3mya) of the Miocene Period, the collision of the African and Eurasian continental plates cut off the Mediterranean Sea from the Atlantic, isolating the sea bed leading to evaporation leaving salt deposits. This was known as the Messinian salt crisis. A major event, the Zanclean flood occurred 5.3 million years ago when the Straits of Gibraltar were breached and water surged in from the Atlantic filling in succession the oceanic basins from west to east combining to the magnificent Mediterranean Sea . The mountains were formed during cycles orogensis beginning in the Jurassic and ending in the Cenzoic periods. These phases are referred to as Eohellenic, Mesohellenic and Neohellenic. The mountains are constructed of a complex pile of nappe. At the simplest level this means that the mountains are built up of huge slabs of rock pushed up from the ocean floor, fractured and folded by the huge forces created by an advancing tectonic plate, a process called orogenesis. Nappe refers to the sheets of rock which have been moved sideways, for some distance, to be laid over neighboring rocks (nappe thrusting). 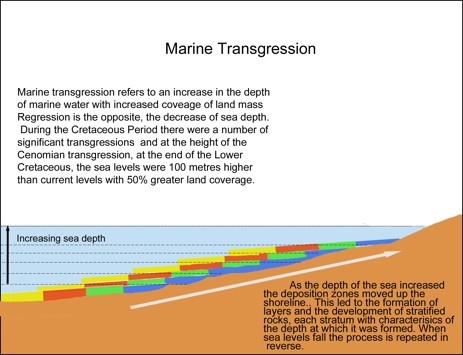 The seismic activity which moved continents was accompanied by and contributed to significant changes in sea levels known as transgression. This resulted in both erosion of existing rocks and the formation of new layers of rocks along the coastal margins. 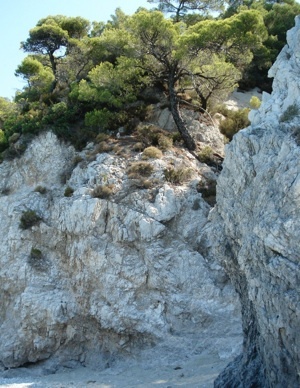 Rock beds resulting from this process are present on Skopelos. 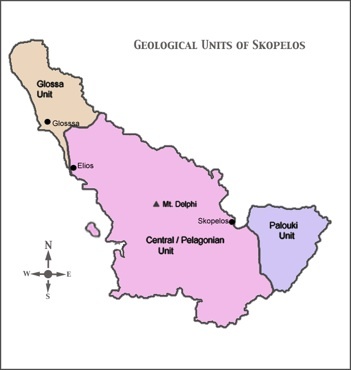 The geology of Skopelos was affected not only by mountain building processes in the Pelagonian zone but also by geological events in the adjacent Axios-Vardar zone, to the North-east. 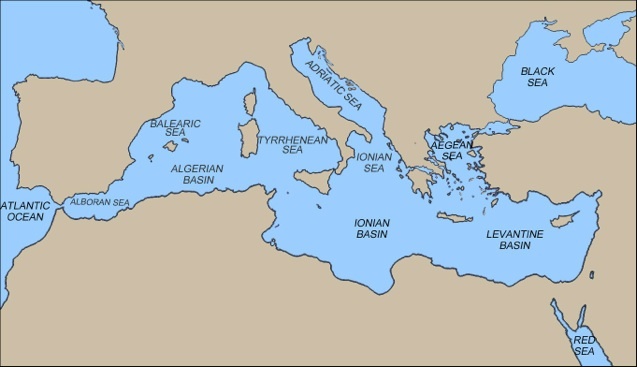 Greece remained part of a larger continent until recent geological time. 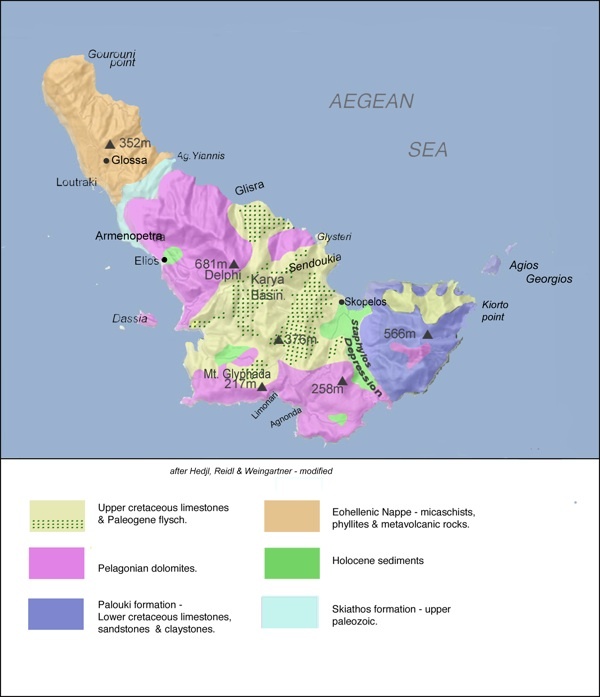 Not until the latest geological period, the Neocene, did Greece and it's islands begin to attain the current configuration. The rocks forming the backbone of mainland Greece and many of it's islands, including Skopelos, were laid down hundreds of millions of years ago, but the processes of continental plate movement, subduction and mountain building, continued into the most recent geological period, the Neogene, a phase of great upheaval. 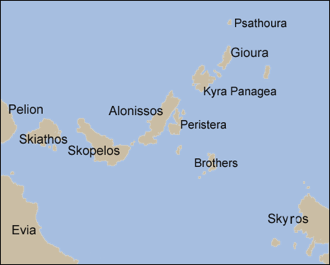 Precisely which islands separated and when cannot be precisely determined 8,000 years ago the Northern Sporades except for Skyros were probably attached to mainland Greece but may have been separated by a shallow, narrow strait. They formed a long narrow peninsula, possibly divided into two. By 9,000 years ago the configuration of islands was much like the present, although even when islands came into existence this situation was not always maintained. The islands became joined again during the falls in sea level which occurred in cycles during the Neogene period, resulting from a series of ice ages, when ocean water was held back in the expanding polar ice caps. During these phases the Sporades could have again become attached to the mainland, although this is not certain. This would have allowed the spread of plants from the mainland to the islands and vice versa. The separation for thousands of years has however allowed the evolution of new species found only in the Sporades and in some cases on only one of the islands (endemics). 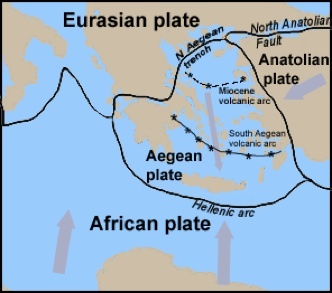 Expansion of the Aegean caused thinning of the earths crust, resulting in arcs of active volcanoes, firstly in the Northern Aegean, during the Miocene period. 4 This created the islands of Samathraki, Agios Efstratios and Limnos. 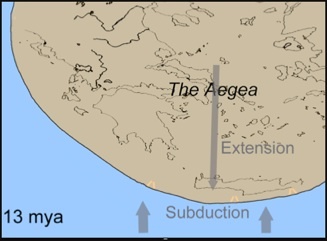 The eruption Psathoura marked the extension of the Northern Aegean Trench, which lies north-east of Skopelos. More recently the development of the South Aegean volcanic arc, which extends from Sousaki on the Corinth Canal to Kos and includes the islands of Milos, Santorini, Anti-Paros and Samos. This still remains active and tectonic activity continues and the Aegean Plate expands in a North-South direction at a rate of 30mm per year. The proximity of Skopelos to the Northern Aegean Trench, which is gradually becoming deeper, is the cause of the frequent earth tremors felt on the island. 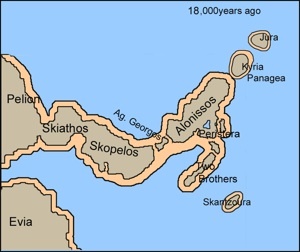 The rocks which would eventually become the islands were formed by sequential episodes of submersion in warm tropical seas, when rocks were laid down on the ocean beds, on the edge of a large continent in a warm moist tropical environment, interspersed by prolonged periods of erosion and weathering. The area has been subjected to cycles of orogenesis with subduction, thrusting, sliding and folding and these features are reflected in the current structure of the islands. The pressures resulting from these actions have resulted in changes in the rocks themselves. 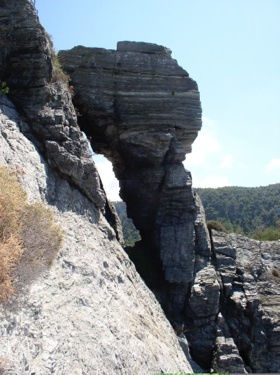 A large variety of rocks have been identified on Skopelos, including volcanic, sedimentary and metamorphic rocks. Schists are the rocks which form when continents collide. They are made up of crystals which all face in the same direction creating fine layers. Green schists, not always green, are formed at medium pressures and temperatures during orogenesis. The Glossa unit is asymmetrical with gently sloping north west coast contrasting to the steep jagged cliffs of the north east of the island. The smooth surface can be attributed to prolonged weathering in a continental environment of the slope connecting mountains to the surrounding plains or coast. It has subsequently been thrown into folds which have created valleys and coves. 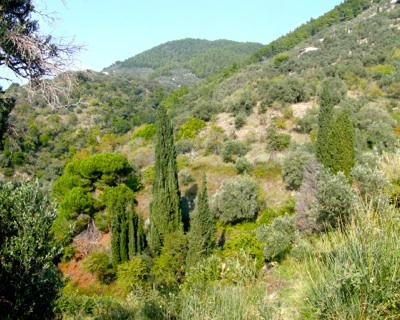 5 There is an abundance of olive, almond and fruit trees with scattered Aleppo and umbrella pines. Cipoline marbles are named after the italian for onion, cipollino. These marbles as the name suggests are light coloured with marbling of darker grey or green. The marbles have been valued as decorative building materials from ancient timed until the present. In this area chasmophytes (rock plants) abound with Mediterranean phrygana, particularly in the area of Gourouni. 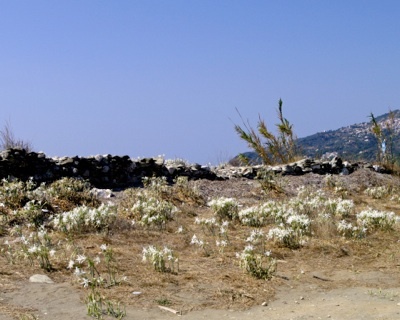 The relatively gentle slope of the coast the fine sandy soils on the shore of the Skiathos outcrop have created an ideal environment for the survival of the sea daffodil (Pancratium maritimum), the main location on the island where this plant special plant can be found. The rocks forming the largest central portion of Skopelos Island including the Delphi Ridge, 281m high are dolomites formed on the Pelagonian shelf during the Triassic period. 6 The rocks vary from almost white to dark grey and sometimes bands of varying colour can be seen. Dolomites are rocks formed in a quiet marine environment. They are sedimentary rocks formed by the accumulation of shell debris of the tiny calciferous marine animals which were abundant in the warm seas of the Cretaceous era. The calcite (CaCO2) is changed to dolomite (CaMg(CO2)3) by the action of algae in a magnesium rich environment. The process is known as dolomization. Many of the dolomites of Skopelos are further changed to a more crystalline form during mountain building phases and have developed a more crystalline form giving them a sugary texture. Rocks of this type form the cliffs of Hovolo Beach. Karst refers to a variety of structures and landforms created by the dissolution of carboniferous rocks, which include dolomites and limestone by acidic rain water. This creates clefts, widens faults and forms underground streams and caves. In many areas the dolomite rocks have been eroded to create karstic forms, which include sink holes, pillars and cones, which can all be found on Skopelos. 7 Water drains rapidly from karstic surfaces which are often bare of soil developing pavement as seen at Sendoukia. Conglomerates are sedimentary rocks with smooth stones varying in size from pebbles to boulders cemented together in a fine rock flour. Breccias are similar to conglomerates but the stones are fragmented and angular. Rudists were bivalve shell-fish with calcitic shells, which thrived in a reef environment in tropical waters during the late Jurassic to late Cretaceous periods. They are abundant in rocks throughout the Mediterranean. 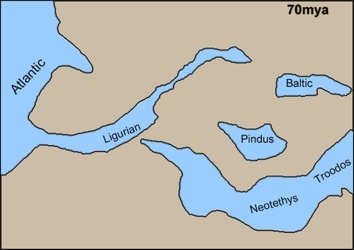 The next layers of rocks, laid down on the Pelagonian Unit were limestones. These rocks are referred to as rudist limestones after the fossils found in them, they were probably deposited in the Upper Cretaceous epoch. 6 They are occur on the south eastern slopes of Mount Delphi but except for the Karya Basin are for the most part covered by Paleogene flysch. 6 The character of the limestones vary reflecting the situation in which they were formed, tidal lagoon, reef or deep continental shelf. 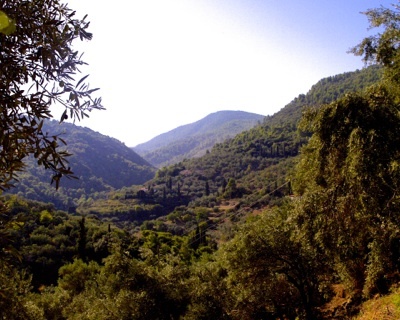 The limestone-flysch area of the central, Delphi Unit, has much more diverse vegetation than the dolomite zone, with a variety of broad-leaved trees and shrubs, interspersed by olive groves and orchards. Layers of sedimentary rocks which form offshore as mountains are pushed up by tectonic activity. rocks in this part of the island show evidence of folding and refolding. A boat trip around the shore reveals the complex folds and layers of rock which make up the island. Chert is sedimentary rocks containing silicon dioxide created when diatoms, single celled algea, accumulate. The cells die, dissolve and recrystallize, forming sheets or nodules. All the rocks of the Palouki Unit have undergone low grade metamorphosis and have been deformed by large-scale horizontal folds. It is thought that the rocks were formed in a deep ocean and thrust over the basement layer. They were, probably once covered in Eohellenic nappes which were subsequently destroyed by erosion, 6 creating the red soils and conglomerates as seen in many parts of the island. 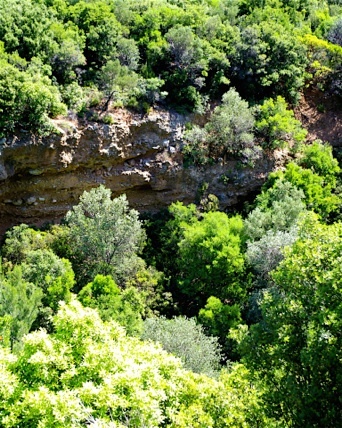 The dominant vegetation on the Palouki Unit is Mediterranean maquis, this varies from 'high' maquis with taller trees and shrubs, including, Holm Oak, Kermes Oak and Lentisk, to low maquis mainly of Cistus. In open rocky areas Junipers are present, these are one of the few plants which grow only on alkaline calciferous soils. 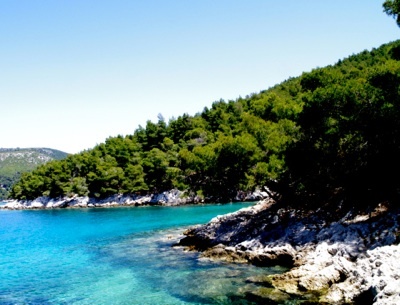 The carboniferous rocks of Skopelos are valuable water bearing structures, holding underground water reserves which appear at the surface in the form of springs when the porous carbon rocks overlie impermeable layers. Where there is underground water there is a more lush vegetation with a variety of broadleaf trees and shrubs, creating shady vales. Oriental Plane trees are often found in the vicinity of springs. The freshwater springs provide domestic and agricultural water supplies as well as watering holes for animals. Interestingly springs occur at the base of the cliffs on Velanio Beach which are regularly visited by goats. The Staphylos Depression is a wide flat bottomed valley with gently sloping sides and must have been created in a continental environment. 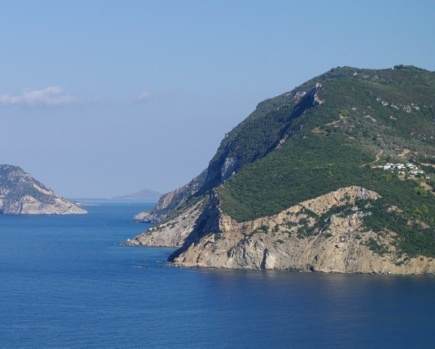 The edge of the overthrust of the Palouki Unit forms the eastern slopes, which runs in a north south direction from Skopelos Town to the Bay of Staphylos. 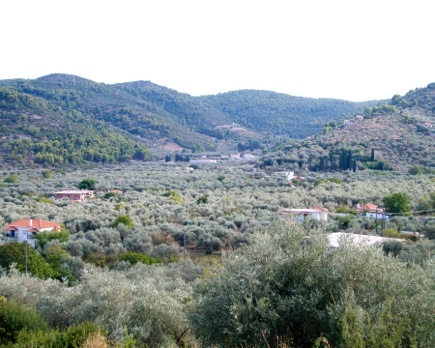 The rich soils and low contours of the Staphylos Valley have provided fertile ground allowing agricultural development of the area with olive groves and plum orchards. Click on reference to open/download. 1.Cavazza & Wezel. 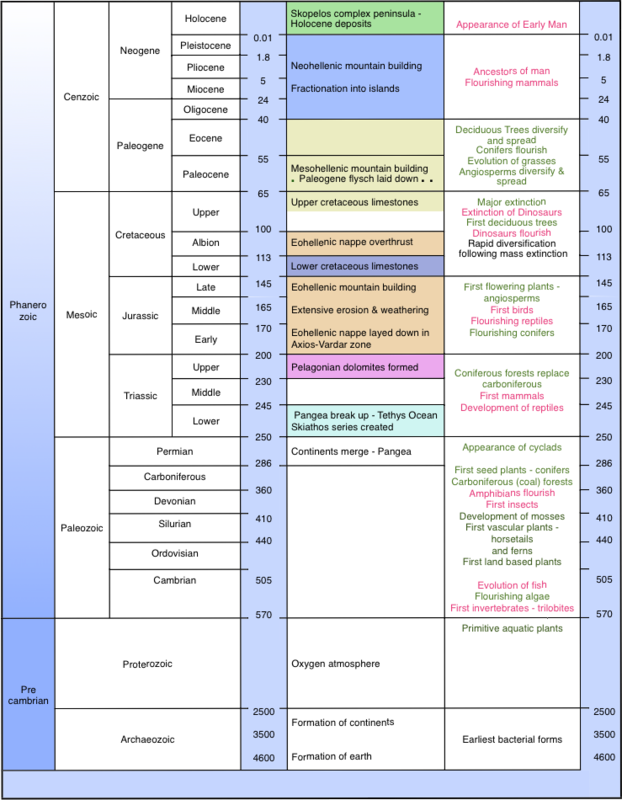 The Mediterranean, a Geological Primer. Sept 2003. 2.Hedjl, Ried & Weingartner. Cretaceous Palaeokarst and Cenozoic Erosion of the North Sporades. 1999. 3.Himmercus, Reischmann & Kostopoulos. 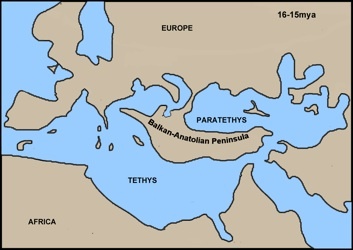 Gondwana-derived terranes in the northern Hellenides. 2007. 4.Le Pinchon & Angelier. The Aegean Sea. 1981. 5.Tjerd, van Andel & Shackleton. 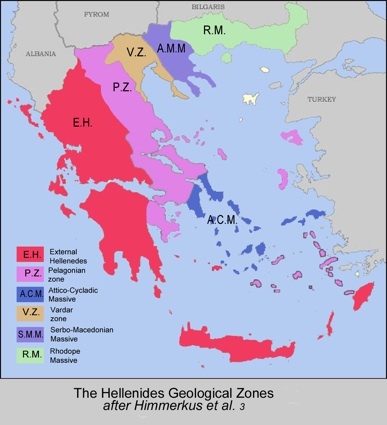 Late Paleolithic and Mesolithic Coastlines of Greece and the Aegean. 1982. 6.Matarangas. 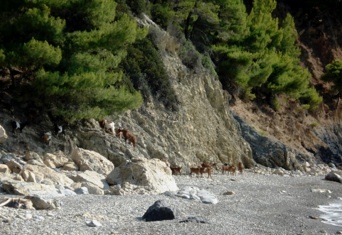 Geological Investigation of Skopelos Island. 1992. 8.Papadopoulou-Vrynioti. The Role of Epikarst in the Morphogenesis of the Karstic Forms in Greece. 2003.